In my one of my "other" lives I am doing my part time Masters so when crunch time comes (and not from a delicious pork crackling) I need to be on my game and alert to juggle studies, work and my other commitments. I leafed through my June MasterChef Magazine and out jumped Curtis Stone... (I wish).. 's quick and healthy recipes - perfect brain food for a time poor exam cramming foodie like me! The key ingredients in the recipes I picked to keep my brain and energy levels high were two relative newbies to my repertoire but well known for their nutritional value: brown rice and turkey. They also both had so many veggies that I got my 5 serves in 1 meal! 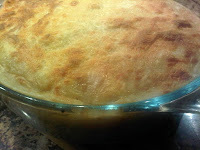 I prepared the Turkey Pot Pie first. Celeriac is on my "food of the season" list at the moment. I love the creaminess of celeriac mash, with the fragrant flavour. The pie was a hearty combo of the lean but tasty meat, which I have only ever used in a Christmas roast, with some pantry staple veggies and was perfect for the chilly Sydney evening. 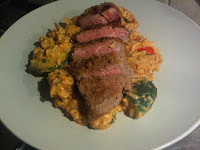 The Cumin Spiced Lamb with Ratatouille Brown Rice was another fabulous nutritional feast to keep my brain ticking over. The nutty low gi rice worked well as the base of the dish and because of the mounds of veggies in the ratatouille, we only needed a few slices of the pink lamb to feel full and refueled! I loved the healthy, heartiness of both dishes preventing me from munching on snacks, that I could make plenty for lunch leftovers (giving me extra time to study instead of making up sandwiches) and that they kept my brain ticking!